Are you still struggling to decide the best RAM for Ryzen? Well, we exactly understand what situation you might be going through. Though Ryzen has improved a lot as compared to its past versions due to an updated BIOS, people still face an issue with the RAM speed, especially when you want to run it at a stable speed of 3200 MHz. On some forums, people have complained that they are not even able to achieve a stable 2133 MHz which made us realize the issue due to which this detailed post covering the 7 best RAM for Ryzen happened. Just to give you the intensity of how this detailed review was prepared, we initially reviewed 17 different RAMs. Since there are various options in the market but only a few of them have got good reviews which actually solves the speed issues, we picked the top 7 RAMs. For the review, we have primarily looked into different parameters while choosing the listed RAMs. Features like speed, design, color options, and heat management have been carefully analyzed so that you don’t have to stress much while making up your mind. Let’s dive deep and check these out! Corsair is widely known for the computer peripherals and the mighty hardware that it provides. The company has been building memory components for a long time and has achieved eminence for providing good quality and performance. 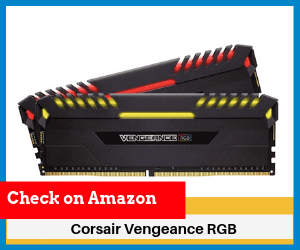 The Corsair Vengeance series of RAM’s has been highly victorious since it entered the market and why shouldn’t it be, it surely delivers excellent performance. 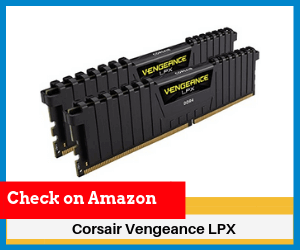 The Corsair Vengeance LPX DDR4 RAM is specially engineered for overclocking without any heat issues. The XMP 2.0 support in this ensures ridiculously easy automatic overclocking. 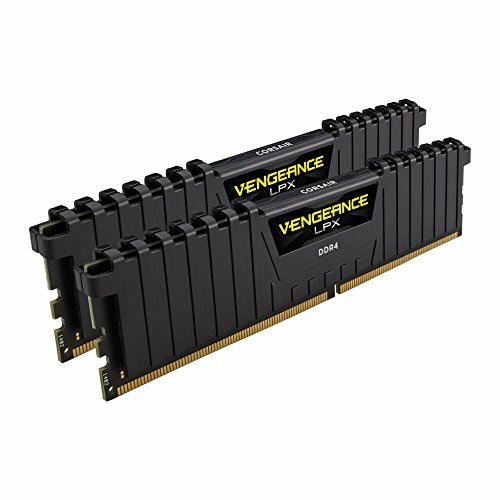 These set of dynamic RAM are available in multiple colors to match the user’s style or the elements on the motherboard. But there are no RGB lights so you all will have to adjust with no glow. It is particularly designed for revved up overclocking. Its speed is overclockable up to 3000 MHz. It has a pure aluminum heat distributor for quicker heat diffusion. It supports XMP 2.0 for effortless overclocking. You just need to turn it on and it will automatically adapt to the fastest safe speed. It has an unheralded design which lets it fit in smaller spaces. It is readily available in multiple colors (black, blue, red and white). It’s a simple yet elegant design. However, there are no RGB lights but the construct looks refined. You can barely complain about the performance of this mighty beast. It works well with both Intel and AMD components and brings the best out of both. Overclocking can result in the RAM reaching higher temperatures easily which can be a bit problematic. But, the extraordinary design of the Vengeance LPX and the heat distribution system helps in spreading the heat towards the system’s cooling. Its structure lets it fit in smaller spaces. XMP 2.0 support is great. It helps in achieving the best overclockable speeds. The available color options are competent enough. The options will surely go well with your PC. The overclockable limit is not high enough. People these days like to have RGB lighting in their computer setups. Sadly, the Vengeance LPX RAM does not provide any kind of glowing lights. Final Words: Corsair Vengeance LPX DDR4 is certainly the best RAM for Ryzen. It has got great response and reviews from the customers. We highly recommend it due to its brand presence and after sale service. G.Skill is a company which is widely popular for the high-end PC components that it presents. 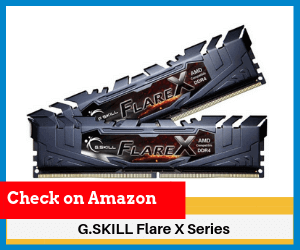 G.Skill RAM’s are one of the best in the market and offer immense competition to the other brands. The G.Skill TridentZ RGB Series RAM has an uncovered light bar sitting on the top which gives it RGB lighting capabilities. This makes it different from the non-RGB model or the simpler TridentZ. If we talk about the performance, then we can say that it surely gives an arduous contention to the rest of the RAM models out there. It also supports Intel’s XMP 2.0 which makes it easier to overclock this RAM. The RGB lights on this RAM are highly customizable. G.Skill provides its own software which will let you try many amazing RGB lighting effects. Altogether the G.Skill TridentZ offers the best blend of looks and performance. The RGB lights do not have any kind of negative impact on the overall performance that the RAM provides. It is a DDR4 type RAM and is overclockable up to 3600 MHz. It supports XMP 2.0 for painless overclocking. This helps in attaining highest and safest possible overclock speed. The main highlight is the RGB lights that come with it. It has completely exposed light bars on the top that change color if you want them to. Some LED light options are already available with it like Rainbow, Comet, Flash And Dash, Starring Night, Glowy Yoyo etc. It supports ASUS Aura Sync software which allows the users to easily control the RGB light system if they use an ASUS motherboard. The entire RGB LED light system on the RAM kit is a visual treat. The looks of it will definitely draw all the attention. This is the best looking RGB LED light system we have seen on a RAM kit till date. Skill provides their own software for controlling the RGB lights on the RAM. The software is also easy to use and offers tons of customizations for the RGB lights. The quality, the build and even the cuts in the RAM are perfect. Even the RGB lights are perfectly vivid and polished. The performance has also not been compromised. Everything has been kept in mind by G.Skill and performance wise this RAM would not disappoint you at all. Sometimes, placing RGB LED light systems in RAM sticks decreases the performance as it interferes with the signals and also generates a lot of heat. This is not the case in this RAM. It still performs the same as other RAMS without any RGB LED light systems. The price at which it is available is commendable. This is a true flagship grade product and is available at the lowest price that you can expect for such amazing specifications. A lifetime warranty has been provided by G.Skill with this RAM kit. There are no such flaws which we could find in this RAM kit. This is another high performing RAM made by the tech behemoth Corsair. 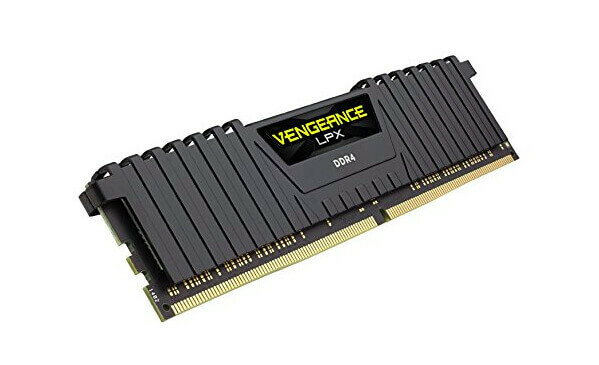 This RAM stick is not much different from the Corsair Vengeance LPX DDR4 RAM which was previously covered in this list. To be honest, the only major difference is the presence of RGB LED light system. This is surely one monster and has got all the top features that you can expect from a RAM for this price. 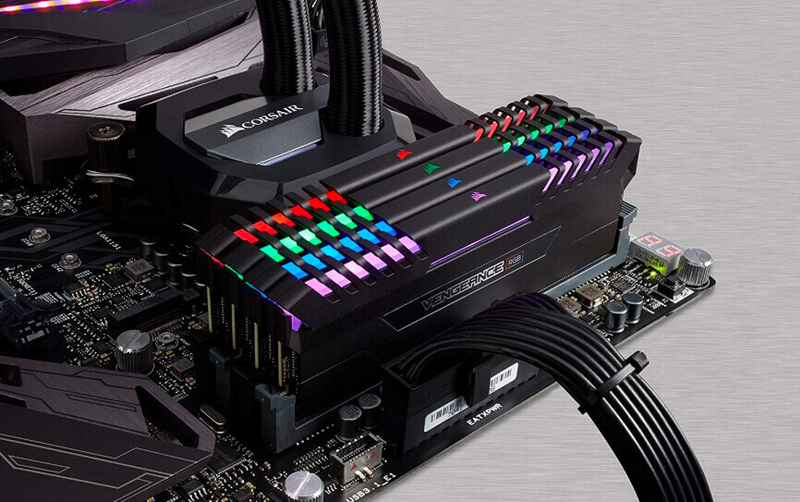 RGB lighting was the only feature that the Corsair Vengeance LPX missed and this variant of the RAM got it all right. The performance and the looks are well balanced. The RGB lighting looks vibrant and has good color reproduction. The anodized aluminum helps in spreading the heat elsewhere so that there are no heat-related issues. This boosts the performance of the RAM too. Corsair Link support enables the users to fully program and control the lighting and transitions. It also assists in memory monitoring. It has boldly designed heat spreaders which greatly improve the thermal conductivity and give a better look to the RAM stick. It has dynamic RGB lighting and a broad range of colors to go with your system components. Has full support of the Corsair iCUE software which makes everything easy. It is optimized to work with all the latest Intel and AMD motherboards. The support for Intel’s XMP 2.0 enables it to select the zenith overclocking settings which are safe for the system. This RAM stick is wire free so there is clean management and everything is handled through the basic DDR4 memory socket. Firstly, let’s just appreciate its simple beauty. The perfectly symmetrical design and the smooth colors that come out of it are just stunning. The overclocking abilities of this RAM are good enough and would not disappoint you much. The XMP 2.0 support keeps the systems safe and at the same time helps in getting the best out of the device. It supports all the latest Intel and AMD systems. Its anodised aluminum build helps insulate the heat. 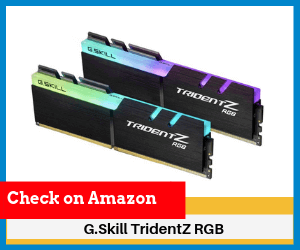 If compared to the other competitors in the market, some DDR4 RAM’s like the G.Skill TridentZ outperforms this device within the same price segment. 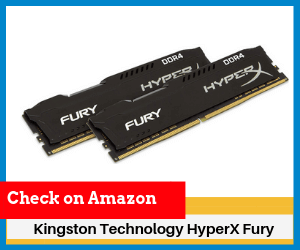 Kingston is another brand that comes to our mind when we are talking about computer peripherals, mainly storage components. It is compatible with most of the Intel and AMD CPU’s and it goes well with AMD Ryzen CPU’s. This RAM has no RGB LED lights or any such lighting effects but still has a pretty good design and a fantastic build quality. With the sturdy build, it spreads the heat pretty well. The price at which this device is offered is incredible. It offers all the good features at a price lower than that of the other devices on this list. Also, there are many color options available for this RAM stick. This RAM kit also has the support of Intel XMP just like all the other RAM’s on this list. Has an impressive design and has many color options which will readily go with your PC setup. Has Intel XMP support for achieving the best overclockable speeds. Has a Fury design which is asymmetrical and with a low profile heat distributor. It is automatically overclockable up to 3466 MHz. This RAM kit is cost-efficient and is definitely a bang for the buck. The support for Intel XMP is a good thing. All the other RAM kits on this list have it too. The design looks fabulous although it does not have any RGB LED lights. The cost at which it is available to the customers is truly praiseworthy. The price is surely the most notable thing about this RAM kit. The overclocking limit is great. It is readily available in many frequency and storage options. It does not have any kind of glowing RGB LED lights. G.Skill always amazes PC enthusiasts with its line of products. The Flare X Series is one another mid-range high performer that every PC gamer would like to have. It has a pretty bold design but sadly you all will have to compromise on the RGB LED lights. It has a steely kind of design which is quite different from the other RAM sticks. The good thing is that it has XMP enabled for Ryzen CPU’s. Not all RAM’s are compatible with the AMD’s new lineup of Ryzen CPU but G.Skill kept this in mind and took action. 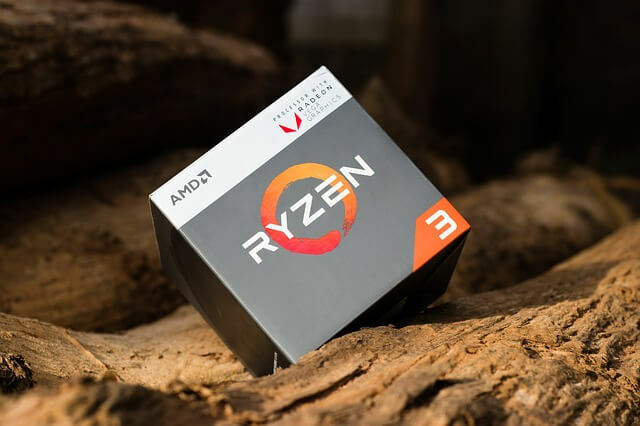 It is specially designed for the AMD Ryzen CPU and is a treat for the PC gamers as this combination will surely provide the perfect gaming experience and the power to conquer high overclocking limits. Its speed is overclockable up to 3200 MHz. It has a fairly distinct build which is quite dissimilar from any other RAM stick. It is specially made keeping the AMD’s Ryzen CPU in mind and perform well with them. It supports Intel’s XMP for better optimization. The support for AMD’s Ryzen lineup is good. It is specifically made for and marketed with the AMD Ryzen CPU. The Intel XMP support is still present which really affects the performance in a positive manner. It has a fascinating, low heatsink structure. It is available in various capacities and frequency options. The overclocking capabilities of this RAM kit are marvellous. Skill grants a lifetime warranty with this RAM kit. It is a bit costly seeing the limited features that it provides. This too has no trendy RGB LED light system in it. This is another G.Skill RAM kit that will offer all that you need from a standard RAM with a satisfactory price. This is simply the non-RGB variant of the G.Skill TridentZ RGB Series DDR4 RAM. This too has a stunning look but just lacks the RGB LED lights. So if you are a fan of glowing lights or you just simply want glowing RAM sticks in your PC then this is not the best RAM stick for you. It has a special build that helps in heat dissipation. It is designed for gaming and overclocking just like the RGB Series of the G.Skill TridentZ. 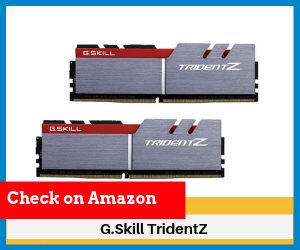 The price of the G.Skill TridentZ DDR4 RAM is also acceptable and it provides all the important features in the price paid. This RAM kit is overclockable up to 3200 MHz. It is specially optimized for 6th generation Intel processors and Z170 chips. It is dual colored and looks luxurious and has a fairly different fin design which helps in dispensing the heat generated. It also works well with AMD Ryzen CPU. A limited lifetime warranty is also provided by G.Skill with this device. The build quality of the RAM stick is great. It has a dual colored body with a sleek design. It is engineered in such a way that the body dispenses heat easily. It is supported by AMD’s Ryzen CPU which is a really good thing. 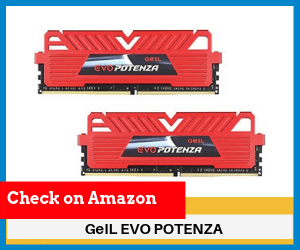 The lifetime warranty provided by G.Skill with this RAM kit shows the company’s confidence in the product. There is not much price difference between the RGB Series of the G.Skill TridentZ and this product. So why would someone want to go for a non-RGB variant of the same product? Most of the buyers must have not heard anything about GeIL and its products. This company is Taiwan based and mainly focuses on constructing RAM for PCs. The best thing about this RAM is its thermal conduction and heat handling capabilities. It has specially designed MTCD technology. MTCD stands for Maximum Thermal Conduction and Dissipation. There are no RGB LED lights and the design is a bit uncanny. The design does look a bit strange unlike any other RAM stick in the market. The performance is satisfactory and we cannot complain if we see the price of this RAM kit. The installation is also hassle-free. This RAM stick is equipped with good heat spreaders and has Maximum Thermal Conduction and Dissipation technology. It is price efficient and offers decent performance. The speeds are overclockable up to 2400 MHz. It has decent looking heat spreaders. The highlight of this RAM kit is the heat dissipation. This product is not too costly and offers great value for money. There would not be any heat-related issues while overclocking so the performance while overclocking would be better. This RAM stick has a decent design. If we go by the reviews on Amazon, some people faced issues with the quality of the RAM stick. There are no RGB LED light systems so people will have to adjust with the traditional look. Now that we have uncovered the top 7 performing RAMs for Ryzen, choosing the best among them can also confuse some of you. Ideally, you should go for higher-end versions that can achieve at least 3200MHz. The funny part, many of the RAMs can’t actually achieve the advertised price until and unless you manipulate and play with the BIOS. One more thing, always check the RAM kit for its manufacturer. Do make sure that the RAM kit you select is manufactured by the same vendor for your motherboard. Corsair LPX 32GB DDR4 DRAM certainly takes the top position for Ryzen PC. Being designed for high level overclocking along with an exceptional design, it will make your Ryzen PC ultra fast. 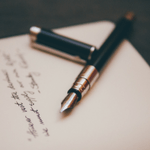 We hope that you have enjoyed reading this detailed post. Choosing the best RAM for Ryzen Desktop is not an easy task as it seems. You need to first check your motherboard details and configurations. Preferably, the best RAM is one which can achieve the designated speed without changing the BIOS. You can also pair the RAM along with a decent sound card to enhance the gaming experience on your PC. Share your thoughts in the comments section below. We would be able to help you! Great article. You have mentioned great insights for any fellow who is using a Ryzen PC. I am thinking of upgrading to Corsair now! Thanks for sharing the details. 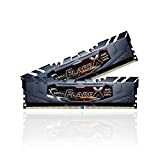 In my opinion, choosing the best RAM for Ryzen is as tricky as deciding the best printer for your house. I like the Kingston RAM. Hope it would speed up my PC otherwise I’ll have to shift to Mac Pro! Very useful information. You have covered the products in so much details. Keep up the good work.